Many traditionally male-dominated industries in science, technology, engineering, and mathematics are implementing new policies and actively trying to attract women to the field. Finding a sustainable work-life balance as a professional woman is a struggle many face, regardless of industry. But the attitude towards women in architecture needs to shift to remove barriers to success, increase diversity in leadership and motivate the industry to design for a better future. Discussions around gender equality in the architecture profession have been rapidly gaining momentum in 2016. Survey results from the AIA's recent diversity study and the annual Women in Architecture survey by The Architectural Review and The Architects' Journal cast a harsh light on the industry, concluding that gender disparities have in fact widened. From underrepresentation in the field to a lack of professional support, being a woman in architecture isn't easy, and appears to come with more challenges than ever before. Part of that shift begins when we recognize that professional support actually begins at home. Women birth 100% of our global babies, except for a limited number of test tubes, and most babies are nursed by mothers from a month to a number of years. This puts tremendous pressure on women who want to have a family and a career and pretty much guarantees a 6-month focus on women as a primary role of food source to infant children and the connection to the home they first knew. The window for satisfying licensure requirements to become an architect corresponds with these prime child birthing and rearing years. Quite honestly, it would be easy for anyone to lose momentum when you are striving to establish yourself professionally, then pause to devote an extended leave to family. Upon return, many new mothers are still trying to figure out parenting and their career simultaneously, which can be quite daunting and viewed as requiring a hard decision between children or careers. I was a mature mom who did not birth a child until I was 35. I remember when my youngest daughter was born almost one month early, and I had pre-arranged for clients to come in from Holland three weeks before I was due--which now equated to one week after she was born. I attended the meeting with a pager on my hip, and my mother in a coffee shop in the base of the office building armed with bottled breast milk, with no idea if baby Julia would take it or I'd have to be paged to come quick. I also remember many a conference call meeting nursing a baby in a closed room while the phone was on mute when I was not speaking. Until the youngest kids were in half-day school, I worked Monday to Thursday from 9:30am to 3:30pm. On Fridays, I balanced work with parent and child activities and worked remotely on weekends or whenever my children napped. With so much going on, I was likely 100 times more organized than I am now--contrary to what might be expected of the productivity of a new mother -- and firmly believe I achieved the same work output as I do now as collaboration and decision-making had to be focused and results oriented. There's a near 50:50 gender split in undergraduate architecture programs, and yet women are grossly underrepresented at the senior management level. Community played a vital role in my success, not just at the workplace or my projects, but at home too. I had flexibility to shift my hours based on my childcare needs, but I also had a network at home that helped my husband and me raise our children: a nanny, my mother, family and friends. 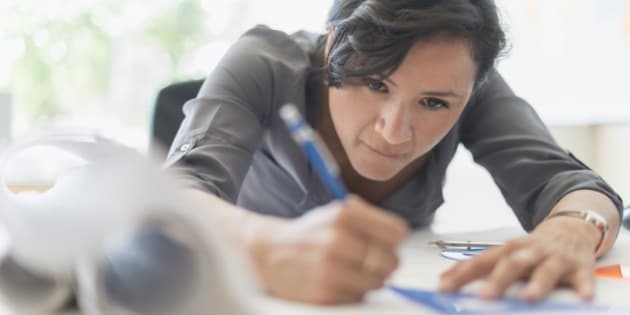 Without that support, many women find it difficult to continue on to senior levels to the detriment of the profession. In 2016, at my firm B+H, I am the Regional Managing Principal of North America and Karen Cvornyek is the Regional Managing Principal of Asia. I do not know of another Top 100 Global Design Firm that has 100 per cent female representation at a global regional leadership level. Forty per cent (2 of 5 members) of our elected (by Principals) Management Committee is composed of women. Our Executive Committee is 38.5% women (5 of 13 members). When women are in senior positions they represent diversity. Diversity breeds different points of view, and I think the vast majority of people listen better when they meet someone different than they are. Generally, I think women naturally promote more open conversation so there are additional points of view raised, discussed and vetted towards decision-making. We share ideas more and are accustomed to listening more. We discuss a broad set of data around a challenge or opportunity, analyze the data and make decisions. Women and men, as well as a culturally diverse collection of folks, working together in a group harness a tremendous amount of power that can lead to tremendous innovation in our industry and results. In my next article, I'll discuss the business case for gender parity, why boards are better governed with female leadership and why gender policy isn't a threat to meritocracy.